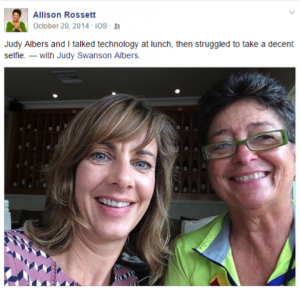 I’ve long admired training (and ping-pong) legend Allison Rossett’s spin on pretty much everything. When we had lunch recently, I showed Allison our Learning Hub™ platform, and she said “What you’ve done here is address all five moments of need.” Cue angel chorus! Of course! When I describe Bob Mosher and Con Gottfredson’s work on the five moments of learning need to learning professionals who are new to it, the mental light bulbs are practically blinding. Each of us approaches a body of knowledge in a different context, depending on what we know already, and what we need to know today. I’ve seen platforms that fulfill some of the five moments of need really well, but not all of them. I think that’s what resonates so profoundly with our clients -- the way bite-sized content and collaborative features can be arranged for exactly the contexts each project requires, and the needs each learner has. Within these contexts, we make it real. 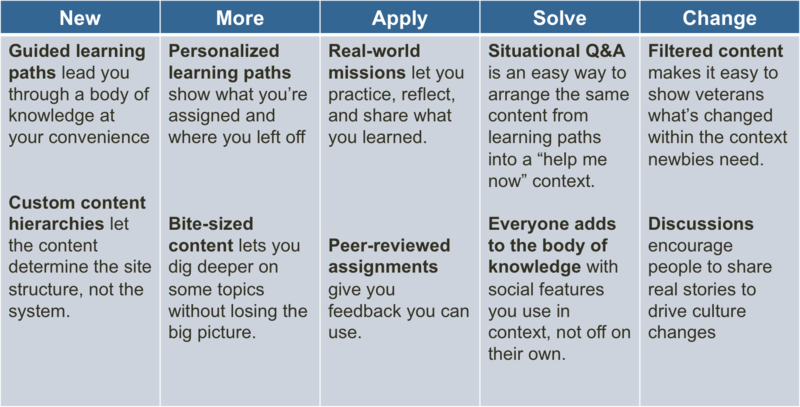 Interactive exercises help learners reflect on what they learned, practice it on the job, internalize it, and share their new insights. Curious? Take a peek at a few of examples of how it works. Judy Albers is a Principal Consultant, Learning Experience Design, and has been with Intrepid since 2006.